In a matter of weeks the leaves will be gone, the corn harvested, the skies a more muted blue. The old red barn will remain but the context will have changed dramatically. 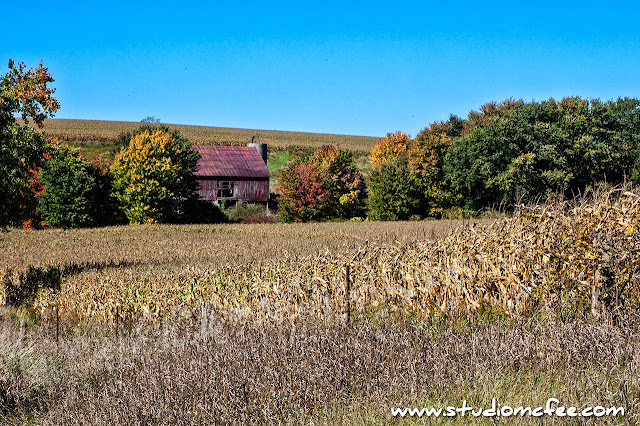 In this photo the old barn blends with the autumn colours. At the same time the magenta hues of the fading red paint are different enough to add a new element. The grasses in the foreground seem to pick up those hues. What a splendid context for this barn in decline. But imagine the fading red barn surrounded by denuded trees, stubble fields and a gray sky. What's hidden behind the autumn foliage? What is there to see that cannot now be seen? How will this new context affect the scene? What will be the emotional impact? Context changes everything not only in photography but in life. This is the third photo in the series 'Autumn in Ontario'.